Early Saturday morning was chilly and quiet in downtown Raleigh. Frigid temperatures kept many indoors. But it was impossible to miss a large crowd beginning to congregate on the Lichtin Plaza in front of the Duke Energy Performing Arts Center on South Street. It was also hard to miss the music. You could hear it from blocks away. By the end of opening prayers and speakers on the plaza, there were around 2,000 people assembled for the HKonJ 2019 Moral March. 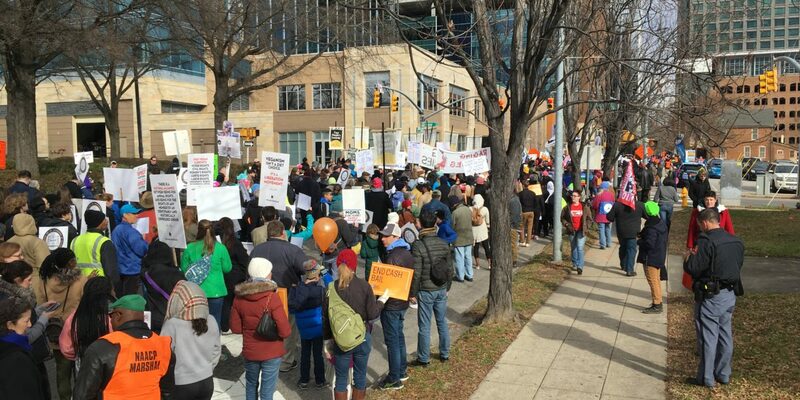 Since 2007, the Moral March has drawn a variety of civil rights causes together in North Carolina’s capital to rally for a range of policy before the state legislature. On Saturday, they started up South Wilmington Avenue and then onto Fayetteville Street, where the main rally was to be held. The central theme of this year’s Moral March was children. During his speech, Reverend Dr. William Barber said it was the first duty of the state legislators to protect the most vulnerable in our society, specifically highlighting children. North Carolina NAACP branches organized the march, but many different groups took part. Jana Dux is the membership lead for gun reform advocates Moms Demand Action in North Carolina. She said her role as a mother and teacher were tied to her political beliefs. But not everyone came with an advocacy organization. Renie Palmer is a Cary resident and came with a friend. As she looked around the assembled crowd, Palmer said she felt hopeful because of the range of issues represented there.